Rene is Lisa's younger, fraternal twin. Rene's color is red. Do you see a pattern here? R for Rene / R for Red. Color-coding is a wonderful thing. Rene's current interest is in re-enactment (California Gold Rush, Civil War, Dickens Christmas Fair), so she wanted a southern belle sort of design. What *I* wanted was to find an outline sort of design, as I kinda figured a stitch-intensive design wouldn't work too well with fleece. However, I couldn't find a design that we both could agree on .. and after all, if this was to be her blanket, shouldn't she like the design? A radical idea, for sure, but what the heck .. I'm a radical kinda gal. 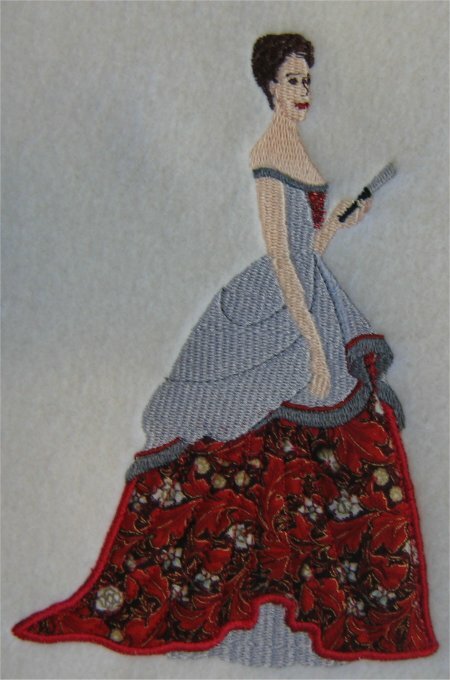 After more searching, I found a combination stitched & applique design that she liked. This Southern Belle was purchased at "www.WearItWellDesign.com", which as of 2010, is no longer online. This site had very, very, very clever historical fashion figures with part of the design fully embroidered and part of the design appliqued. 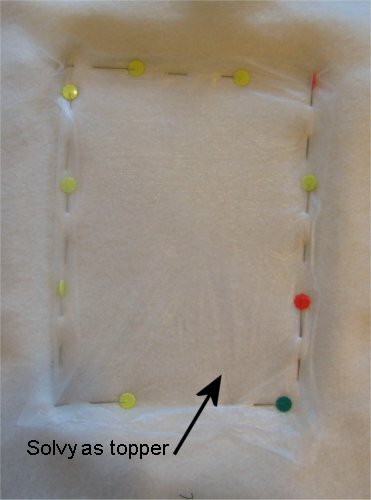 Rene decided that she wanted the fleece to show where the applique would have been, so that's what we did. The binding was a lovely burgundy (OK, let's call it a deep RED) with metallic gold swirls. The gold metallic in the binding coordinates nicely with the gold of the name and in the dress. The alphabet is Commercial Script from Mountain Threadarts Yahoo group. It also contains upper case, lower case and numbers. It was stitched with Superior Threads gold metallic, which is my all-time favorite metallic thread. It stitches wonderfully without breaks, loops or snags. The Southern Belle a lovely design, but .. and here's the Learning Experience .... since I didn't use a dry topping while stitching, the sections didn't register correctly .... the fleece stretches, ya know? (I certainly didn't realize it before stitching.) It wasn't until AFTER I had done all but one of the blankets that I read about using a dry topping, in addition to the stabilizer. Well, live and learn. One aspect of this design that did come about as I expected was the denseness of the stitching causes the design to cup upwards. I knew this was going to happen and it sure did. However, that can be corrected by some judicious steaming after being washed. Rene doesn't seem to mind and tells me that her blanket works just dandy. Later addendum: I restitched the Southern Belle, this time using Solvy as the topping. I hooped Floriani Wet-n-Gone, pinned the fleece and Solvy to the Floriani (you can't see the hoop cuz the excess fleece is covering it). What a difference! Look at the picture on the right! You can tell by comparing the two pictures that the stitching with the topping was clearly a better stitch-out. No gaps, no elongation. (Yes, I did use a fabric applique this time, but I don't think the lack of the fabric was detrimental to the original stitch-out.) I'll use this stitch-out as part of a throw pillow for Rene.